If you are a busy professional who travels a lot for your job, then a rolling bag that will hold your computer too is one very smart choice. Rolling bags are also great for the person who has to park a far distance from the office, ride the subway to work or perhaps has to walk to a meeting or courthouse. This particular bag comes in “power red” or black and offers an inner compartment specifically for a laptop computer with extra padding and a strap that hold it in place. An outer pocket with easy access holds credit cards, pens, mobile phones and your keys. Inside pockets can hold books, files and other work related essentials. 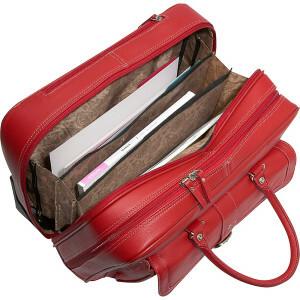 Today’s busy business women often find themselves having to travel for the job and they have to take their briefcase with them because it holds the important documents, their computer, and other miscellaneous items that they will need for the trip.